The new on-line measuring System 182 is a remarkably compact two-channel monitor with integrated power supply, controller, operating unit, analog outputs and relays or optional digital outputs. Typical applications, e.g. control of nitrification/denitrification can be covered with one single System 182: Just connect the D.O. 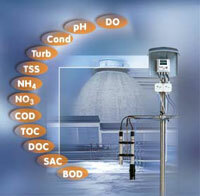 and the ammonium or nitrate sensor and you will instantly obtain the data to control your process!